It’s time to go Bonkers for slots! Click here to play! And this is the perfect game to get you in the mood for some guaranteed wins. 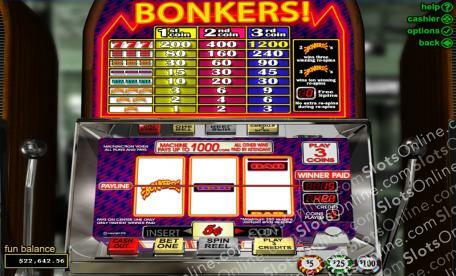 Like any other slot, you’ll be looking for your winning lines, but what’s more exciting is when you get Bonkers. The Lucky Sevens are out in full force in this game, paying off up to 1200 coins if you can manage to spin three across the pay line. Single, double and triple bars pay out a hefty sum as well, with up to 45, 90 or 240 coins up for grabs. Or, just to make it easier to line your pockets with cash, if you get Any Bar, you’ll be rewarded with up to 30 coins. But perhaps the best thing about getting Bonkers for this game is the Bonkers icons. If you’re lucky enough to spin three of these, you’ll get a pay out up to 9 coins. Two will get you up to six coins. One will get you up to three. Even better, if you spin two to three of these icons, you’ll be rewarded with up to ten free respins. We’re not talking about just any respin. These respins are guaranteed winners. With guaranteed wins on the table, I can’t think of a better reason to get Bonkers for Bonkers! Two to three Bonkers icons will award you with up to ten respins that will result in guaranteed wins.